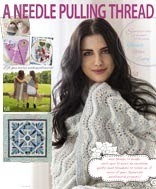 It's a bit intimidating to be the very first Friday Feature poster on The Needle and Thread Network! I'm in very esteemed company indeed. I'm not sure I qualify as an artist per se, as some in this network really do. 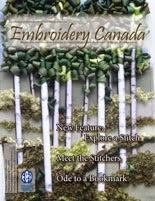 My name is Rita Penner and I live in a small village just south of Ottawa called Greely. There's a tiny stream that runs through the village and many many moons ago, there used to be a mill. That business enabled a hotel to start and I think that's pretty much all Greely had to offer besides a stop for those on the way to elsewhere. Over the years, we got a gas station which is now gone and the Greely Cheese Shop which was a wonderful bulk food store: the best kept secret around. The lady who ran it got old and the store closed. Now we boast a post office, an elementary school the local children can walk to, a medium sized grocery/liquor store, a veterinarian, a doctor, a hair cutter and a real estate office. I have sewn steadily for a LOT of years, since high school "home economics" class. Anyone remember those? Besides normal clothing, I sewed winter wear for my slim tall daughter and went on to coats for my husband and me. Curtains, slipcovers, skating dresses, bathing suits, dog coats, you name it. I've quilted for a few years and got into machine quilting to deal with these quilts I made. 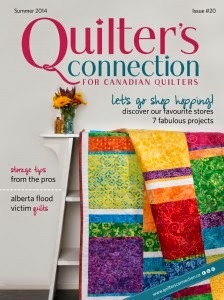 I also am a self-employed sewer who designs and manufacturers ringette pants (www.PennerAll.com), so I already had the sewing machine I needed that fits onto the quilting frame I bought. My machine quilting setup is a 10 foot mid-arm, using hand-quided side-to-side designs that I create myself. 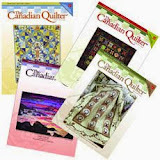 Check out "Machine Quilting" in the black row at the very top of the blog. 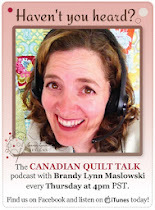 I started blogging to create an online presence that gave some reality to this machine quilting business but it's been more of a vehicle for making friends all across the globe who are also interested in quilting and that's been a lovely surprise. This quilt I've shown was also pieced by me. I machine quilt a lot of quilts for the Common Threads Quilt Guild. They give away hundreds of quilts to various groups every year though I'm just one of the quilters. Right now, the bulk of my paid machine quilting has been personal contacts but there seems to be a steady flow of those and I'm as busy as is comfortable. All in all, life rocks at the moment. Another interest of mine is vintage aprons. I'd love to make more of those but how many aprons does one person need? And the craziest thing is, I don't even wear them often. I just like to sew them. Periodically I publish tutorials. I did one for self-binding baby receiving blankets, 7 bags to wrap Christmas gifts from a metre of fabric, quilt blocks, even for creating blog buttons. This week my niece had the twins that I made these quilts for. They were each 6.5 lbs. Mother, babies and the dad are all doing well. There are lots more quilts that have been made. If you're interested in visiting my blog, please do! If you'd like to subscribe, that would be excellent. You just press the orange button under "Sunset" at the top of the blog. I don't post a lot - probably once a week but I'd love to have you visit!! Thanks for reading about me! !